It was quite a small class on the defensive side of the ball, but that’s what happens when you have very little time to put a class together. Getting Johnson and Washington to flip on signing day were absolutely massive pulls. You can check out my recap on the offense here, obviously this is going to be quite brief. Shelton Johnson: A big Signing Day snag for Michigan. Shelton is a lengthy DE and will have immediate impact with such little depth at the strongside DE spot. He’s got a great frame to add weight and he’s a freakish athlete. The fact that Florida State wanted him badly should be a good enough sign for people. He can either put his hand in the dirt or stand up, but his versatility is going to be key in college. Reuben Jones: Jones will always have the distinction of being Jim Harbaugh’s very first commit he ever got at Michigan. Jones flipped from Nebraska and he’s a good get. He needs to add some weight, but he’s very fast and his frame is good at putting offensive linemen on skates. He’s very good at attacking the ball, and I think he’ll be a good player when he refines his technique. Tyree Kinnel: Kinnel played cornerback and safety in high school but he’s going to be a safety at Michigan. He doesn’t have prototype size, but he’s got a high IQ and some very good instincts. And while he needs to work on his coverage skills, he’s great at attacking the ballcarrier and has no problem making wrapping up or putting a hit on a player. Kinnel committed to Michigan August 23rd, 2013 and deserves credit for being one of the few players to stick around. Keith Washington: Washington is a Signing Day flip out of nowhere; previously committed to Cal. He’s a very nice athletic player who mostly played QB in high school, but will be a CB in college. Obviously he’s going to be very raw at CB to start, but he doesn’t have to play right away and you can’t teach 6’2″ 170 lbs with some long arms and great quickness. Obviously he’s not great at tackling at the moment, but he can turn and run with most any WR. Michigan may also get a grad transfer from Wayne Lyons. Lyons is a 6’1″ CB from Stanford, who played in 13 games last year. He would be a great depth add for Michigan and would be inserted into the lineup immediately. On a final note, be happy with how this class turned out. Harbaugh went skydiving without a parachute to put this together and it all turned out pretty damn well. Perfect? No. But keep in mind that Michigan’s number 1 recruit this year was Jim Harbaugh. He might as well have been a six-star guy. 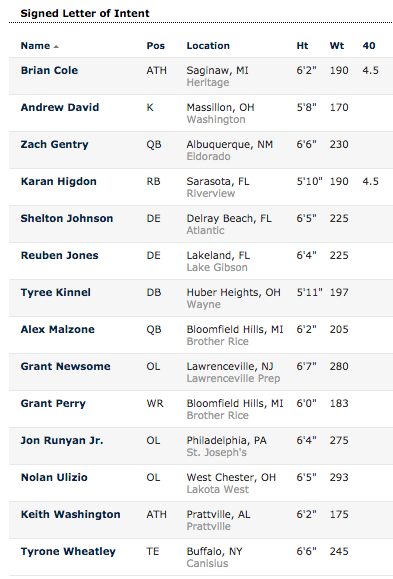 Here’s an interesting read from MGoBlog on the best recruits playing. And here is a projection for the 2016 class and how the staff could fill it. This entry was posted in College Football and tagged Jim Harbaugh, Keith Washington, Michigan Football, National Signing Day, Reuben Jones, Shelton Johnson, Tyree Kinnel. Bookmark the permalink.